ATVWerx Service/ Parts and Accessories - Your ATV, UTV, 3-wheeler parts store! Welcome Riders, orders over $99.99 are Free Ground Shipping (lower 48)! Local to Memphis, TN?..we service all ATV and UTV's! ATV Werx is constantly on the lookout for new ATV parts and accessories so you don't have to. That means our online catalog is always growing. If you are looking for a part and just can't find it, please call us. Chances are we're already in the process of loading it up. Need help with product applications? Don't guess and hope for the best, call or email us and let us find just the right fit for your ride, saving you time and money. 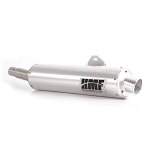 HMF Racing 341293607488 The Swamp & Swamp XL Series set a whole new standard for the horse power, sound, and durability an exhaust adds to a machine.